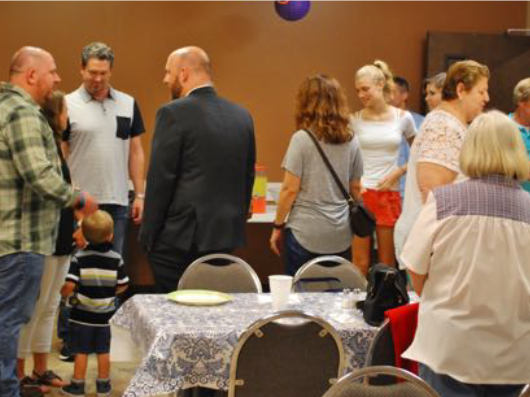 At St. Mary’s, we understand that finding connection and a sense of belonging is the first step in discerning a church home. You are invited to explore our vibrant ministries and discover where God is calling you to use your gifts. Formation - Gather for weekly Bible Study and Sunday School meetings. For more information, visit the Formation and Fellowship page! Holy Stitchers - Meet once a month for knitting and fellowship. Sunday Morning Fellowship - Provide snacks and treats for the post-worship hospitality table. Grounds of Grace - With a team, mow the church property once a month. Primetimers - Outings to various local sites and events for 50+ with transportation provided by Harris County. 249&Hope - Feed the homeless who live along Hwy. 249. Lord of the Streets - Serve breakfast and worship with the homeless and formerly homeless. Seafarers’ Ministry - Prepare a shoebox full of goodies for those who arrive in the Houston port at Christmas and cannot leave their ship. ReadON! - Donate and/or deliver new books to schools in need. Bags of Grace - Prepare bags to give to those in need. Carlton Center - Provide lunch/goodies for the staff of the Cy-Fair ISD Special Education Facility. Altar Guild - Prepare the church for worship and maintain the vestments and altar wares. Flower Guild - Arrange the altar flowers for Sunday. Music Ministries - Sing in the choir or play your instrument during Sunday services. Ushers - Distribute worship materials and help direct the congregation during worship. Greeters - Welcome those arriving for worship. Bread Baking Ministry - Bake the bread that is shared at Holy Community. Prayer Blankets - Sew prayer blankets to be blessed and given away. Prayer Shawls - Knit prayer shawls to be blessed and shared with others. The Order of the Daughters of the King - An international Order for women and girls focused on a life-long program of prayer, service, and evangelism.